It began in Yucatan, Mexico and eventually came to what is now Tanzania in 1893. A short while later Sisal bulbs were sent to Kenya. Sisal had a slow start in Tanzania, it wasn't until the 1960's that it prospered. Mexico and China both import the end product rather than grow the plant now. 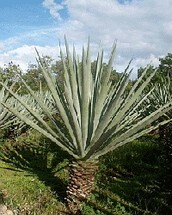 Today Brazil is the largest producer of Sisal fabrics. It is course by flexible. It has value for ropes because of its durability and strength along with its resistance to sea water.